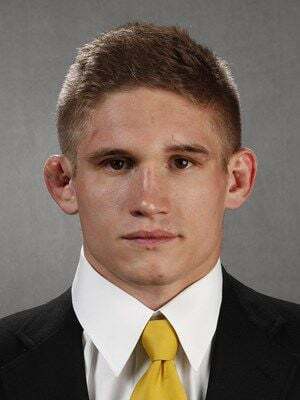 IOWA CITY – Stepping into the lineup Friday for Iowa’s third-ranked wrestling team, Mitch Bowman and Paul Glynn didn’t waste any time proving that they belonged. Both recorded first-period pins as the Hawkeyes overwhelmed Maryland 48-0 in front of a crowd of 9,738 at Carver-Hawkeye Arena, Iowa’s first shutout of a Big Ten opponent since blanking Michigan State in 2017. Bowman, returning to action at 174 pounds after missing three meets because of injury, and Glynn, stepping in for suspended Austin DeSanto at 133, recorded half of the Hawkeyes’ pins in a dual which saw Iowa record bonus points in eight matches. The junior from Bettendorf had opened a 4-1 lead before locking up the Terrapins’ Orion Anderson in a cradle and collecting the fall in 1 minute, 46 seconds. Bowman, a senior from North Scott, had built an 8-3 lead over Josh Ugalde before dropping him in 2:44. Second-ranked Alex Marinelli at 165 and Spencer Lee at 125 also recorded falls, with Lee needing just 30 seconds to add to a collection of Hawkeye victories that included technical falls by Pat Lugo at 149 and Jacbo Warner at 197 and major decisions by Cash Wilcke at 184 and Max Murin at 141. Lugo set the tone, recording four of his 10 takedowns and recording a two-point nearfall in his meet-opening 24-8 victory. The Hawkeyes (12-0, 7-0 Big Ten) finished the dual with 45 takedowns and were taken down just once by a winless Maryland team. Of Iowa’s takedowns, 20 came during the opening period. In the meet’s only match-up between rated wrestlers, Iowa’s seventh-ranked Sam Stoll defeated ninth-ranked Youssif Hemida. An escape five seconds into the third period proved to be the only point Stoll needed as the Iowa 285-pounded eluded a pair of shot attempts from Hemida in the final period to bounce back from a 3-0 loss to Nebraska’s David Jensen on Sunday. The way Stoll dealt with last week’s adversity, the fast starts the Hawkeyes had in match after match and the aggression he saw from Cash Wilcke early on his way to a 23-9 major decision caught Brands’ attention.